The tea-master held that real appreciation of art is only possible to those who make of it a living influence. Thus, they sought to regulate their daily life by the high standard of refinement which [is] obtained in the tea-room. In all circumstances serenity of mind should be maintained, and conversation should be so conducted as never to mar the harmony of the surroundings. The cut and color of the dress, the pose of the body, and the manner of walking could all be made expressions of artistic personality. These were matters not to be lightly ignored, for until one has made himself beautiful he has no right to approach beauty. Thus, the tea master strove to be something more than the artist,—art itself. It was the Zen of aestheticism. Perfection is everywhere if we only choose to recognize it. Zen and the tea ceremony seek to find “greatness in the small incidents of life.” It shines through in the service, the dress, and the extraordinary public infrastructure of the country, just to cite some notable examples. Everything is so clean and in such good working order. There are some negatives to this, however. On the other side of the coin, it also shows up via a great fear and lack of interest in truly integrating outsiders into its society. I think this is out of concern that they will disrupt the cohesiveness and harmony of the society that has been so carefully built and maintained for many centuries. Some people on my trip went out to a bar and would not be served because they were westerners. The organizer of the trip, an individual who has done business in Japan for many years and loves the country, no longer tries going to bars because he has been refused service each and every time unless accompanied by a local and only in certain places. It’s not my job as an investor to judge, but to observe and analyze and try to figure out where opportunities may lie or risks lurk. Every culture and society have its quirks and idiosyncrasies, and Japan is no different. There is a historical tendency toward homogeneity and xenophobia that has been both a strength and an Achilles heel. The hesitation to integrate with foreign cultures has contributed to it being an expensive place to live and raise kids. This, along with an aging society, low birth rate, and minimal foreign immigration has been the main reasons why the population has been dropping. One of the aspects of such a homogeneous society is how compliant the population is and susceptible to groupthink and its unwillingness to step outside of the box and call attention to the individual. Interestingly, it took an outsider, Masayoshi Son, the Korean-Japanese head of Softbank, to shake up the telecom and internet industries in Japan and to make probably the greatest investment in the history of the world. Softbank invested $20 million in Alibaba and it is now worth $58 billion. Someone from J.P. Morgan spoke to us and he said there are two important rules to remember about Japan. The first is to never underestimate the willingness of Japanese society to endure extraordinary degrees of punishment and self-sacrifice while rule number two is that the elites never forget rule number one. I thought this was a very astute observation and seems to be backed up by history. In the aftermath of the earthquake and tsunami in 2011, this turned out to be a positive attribute as the nation pulled together and endured an almost overnight reduction in electricity generation after all of the nuclear plants were shut down. Japan is faced with the developed world’s worst demographics. The population is expected to go from 127 million to 108 million by 2050. 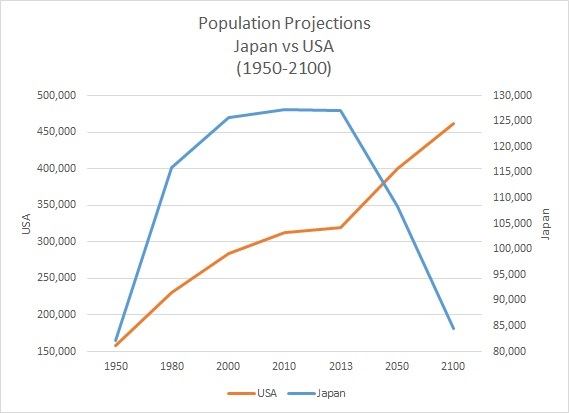 Here is a graph I put together comparing the population projections for the United States and Japan. The United States is projected to grow consistently over the next 85 years or so while Japan’s population is shown to be falling off of a cliff. 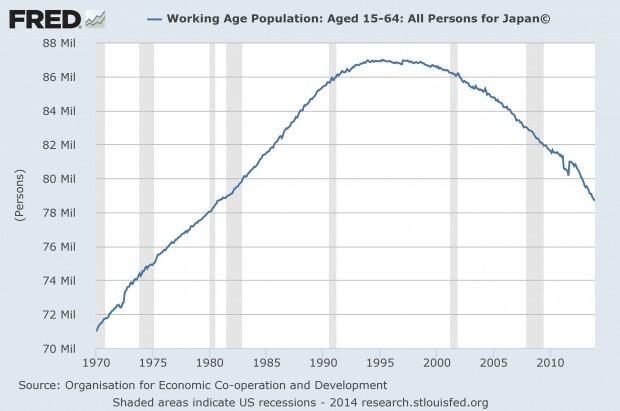 Prior to discussing the investment implications of this let’s look at what’s has been happening to the labor force. The following shows the labor force shrinkage that has taken place since 1997. The labor force has not shrunk as fast as the population overall because more people are working and presumably for longer as well. 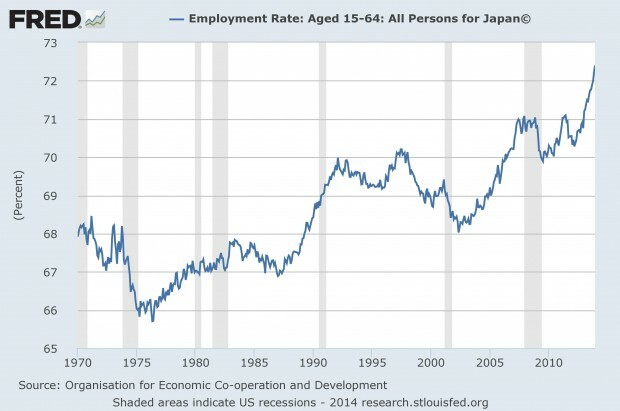 The following chart shows the employment rate for those 15 to 64. It has clearly been on the rise since 2001 or so. The growth in the employment rate is mostly a function of more females being part of the labor force as males have dropped from their peak levels, despite a more recent rise. Women still have a long way to go to catch up with men. 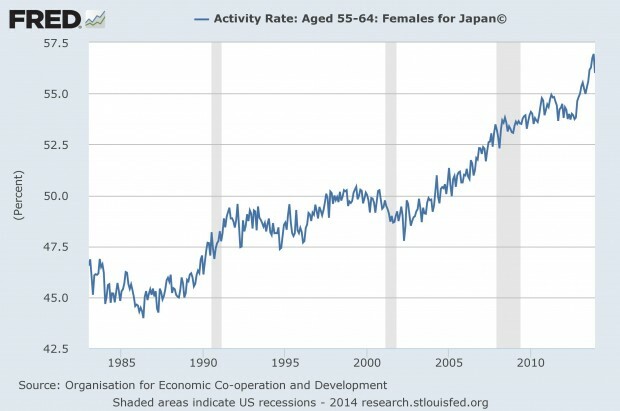 Unless Japan wants to allow more foreign workers in too keep its economy growing, then women are the lowest hanging fruit in terms of where additional workers may come from. The labor shortage is going to grow quite acute with Tokyo having been awarded the 2020 summer Olympics. 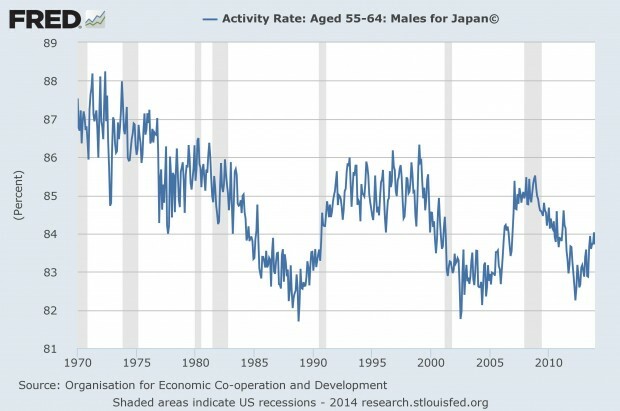 Japan is facing a shortage of construction workers with construction employment having peaked in 1997 at 4.6 million and has now dropped by 26% to 3.4 million in 2013. Japan is allowing work visas for 70,000 foreign workers over five years to help fill the construction employment gap, estimated to be 150,000 because of the Olympics. According to Japanese government statistics, foreign workers make up approximately 1.1% of the labor force. Singapore, in contrast, has 35.7% of its workforce being foreign-born. Its much greater tolerance for foreign labor has led to a strong population in the island nation. For example, in 2004, its population was 4.1 million and today it is closer to 5.4 million, growing by more than 25%. Obviously, Singapore has taken a much different path than Japan which values homogeneity much more. I found it intriguing when the speaker said you can buy apartments at 6% yields and borrow at approximately 1.2% for 15 years. That is a compelling relationship between cap rates and borrowing costs. The question is whether this is sufficient compensation for the risk that demand could be decimated by the contraction in the population. The counter is if you bought in the best areas of Tokyo, would there still be sufficient demand, especially if Japan brings in large numbers of foreign workers in the future? Japan dwarfs the U.S. in terms of cash flow but one not only loses one’s entire investment, but an investor must also write a check to get out of the deal equal to 22% of his or her investment. The U.S. investment produces much less cash flow but does generate not only the return of one’s investment but a profit as well. Interestingly, because so much more cash flow comes to the Japanese investor much earlier that assumes can be invested at the internal rate of return (a very risky assumption I will admit), the IRRs are essentially equal. Essentially this is like an annuity in which there is no return of the principal. It provides a lot more cash flow than the American alternative and a higher IRR despite far worse fundamentals. 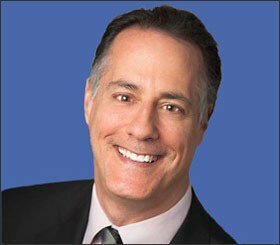 The key is the relationship between the interest rate and cap rate. Thus, it is really important to take into consideration not only the growth rate but the cap rate/interest rate relationship as well before summarily dismissing an investment because of poor demand fundamentals. At CWS, we are pursuing a similar strategy, albeit with higher growth rates than Japan, by utilizing variable rate loans with current interest rates approximately 2% less than prevailing fixed rate loans. This has given us a terrific cash flow advantage over the last three years or so as short-term rates have stayed very low. Some people think the United States might be turning Japanese given how low our rates have been for the last six plus years (Japan’s short rates have been below 1% since 1995 – Update: January 29, 2016, – the Bank of Japan adopted a negative interest rate policy), our quantitative easing, and stimulus during the recession. The difference is we have growth that is strong enough to generate meaningful apartment demand relative to new supply while also keeping borrowing rates low relative to the cap rates properties can be purchased at. 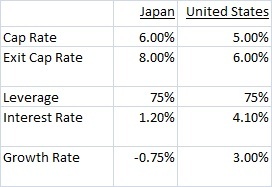 We believe we have the best of both worlds: Japanese low rates and American growth. From our perspective perhaps turning Japanese might not be all bad, especially if we not only continue to find ways to prosper from low rates for many years to come but also if we can also learn to find beauty in the mundane.